Acacia Court Hotel has 150 rooms. All rooms have Queen-size beds with a King Single bed. 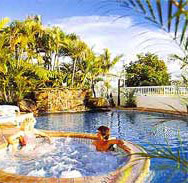 The hotel has a large swimming pool with lounges around to enjoy the sun. Please click here to see a virtual tour of our entrance hall with the reception, the restaurant and the tour desk.